Please join me in welcoming the new additions to my mask family! A few weeks back, I put my face (teehee) in the back seat and decided to post up the photo you see on the left. I enjoy participating in mini contests held by them because their contests, more often than not, give each participant a fair chance to win. The criteria of their contests usually entails uploading a creative photo. It also helps that the prizes usually intrigue me. (I'm currently in a cosmetics and skincare phase). I don't join every one I see though. If it's a prize I know I won't enjoy, I won't join. Mainly because I prefer to let someone else who wants it more to have a higher chance of winning. Good Karma right? Haha. On the other hand, contests that I dislike joining are those that require to "like-and-repost". It is very unlikely that winners are chosen with the help of a randomizer, so what are the odds? Most of the time, winners of such contests are usually a specific type, so it isn't that random at all. Plus I dislike flooding the Instagram feed with reposts. So enough babbling and let me introduce to you the 3 different masks included in the prize. For those who may not know ( i.e. me), For Beloved One is a cosmeceutical brand from Taiwan. FBO is said to be a firm advocate in cherishing every woman and providing a range of safe and effective skincare to the diverse desires and needs of consumers. This particular mask on the left, is actually the first of its kind. Box Description Effectively brightens skin, reduces blemishes and wrinkles and moisturises skin. Bio-Cellulose material enhances absorption of essence for firm, radiant and tender skin and long-lasting results. I own a deluxe sample of the Cucumber Gel Mask, as mentioned in a previous post, and I quite enjoy it. Whilst I don't use that often enough to see a major difference, I like the instant cooling relief it provides my face. I pretty sure I'll enjoy the Rose Stem Cell version too since it seems to be the same texture but won't know until I actually try it. Box Description A cooling, rejuvenating gel to help stimulate cell turnover for younger looking skin. Helps repair signs of ageing, including appearances of fine lines and wrinkles, dehydration, dullness and sagging as it strengthens and tones the look of skin. Ahh... The most obnoxious (and expensive) of them all. Box Description Provides gentle resurfacing exfoliation to activate collagen synthesis to leave skin smoother, brighter and softer to give a more youthful appearance. The mask absorbs impurities without removing natural oils to leave tighter skin texture and tighter pores. I can't mention enough how much I enjoy the sister product, i.e. 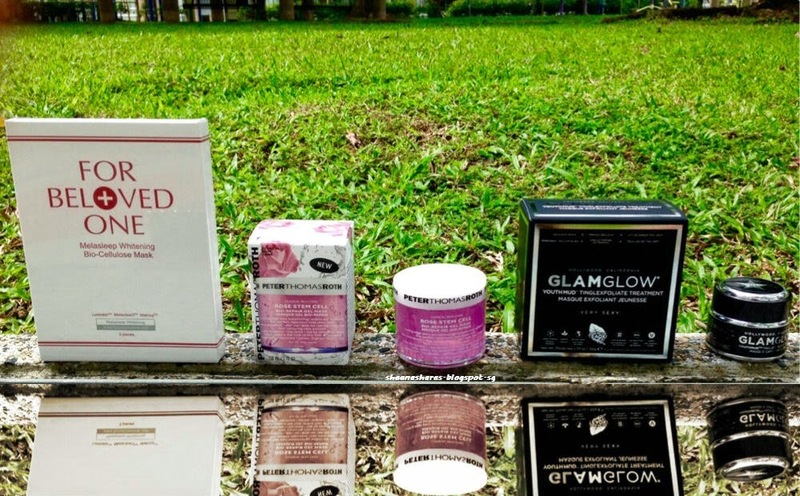 SuperMud Clearing Treatment, and almost been keen to try on the other 4 masks in the line. I was never however, too intrigued that I had to go out and buy the full size of the other masks because if my SuperMud ain't broke, why fix it, am I right? Plus these are too expensive to buy a full size with the risk of not liking it. (For example, the ThirstyMud. I did not like that at all and I'm glad I only bought the travel size). who know they are the coolest and have no shame flaunting it. But apparently, I don't care. Haha. I'll update my findings once I've tried out the masks. A post on the FBO mask will probably come up first since that simply takes a day to test out. After I get rid of backlog though. Hahaha.